I recently spent a couple of weeks in northern Vietnam, up near the Chinese border looking for good things. November is in the dry season, but it can often still be wet and cool up in the mountains. Luckily the sun shone bright and warm for all but two of our days there, which, considering the quality of some of the hiking trails in the mountains, was a God send. There is no really good Flora of Vietnam to refer to, so working out what is what is sometimes a tad tricky, especially when one considers how mega diverse the plant life is. All of Vietnam is well inside the tropics, so to find temperate flora one must get high… and gain altitude. Between highs, one passes through some pretty impressive tropical vegetation, but one mustn’t waste ones time on that, must one? We spent 3 days on the highest peak in Indochina, Fan Si Pan, at 3143m high and also headed into rather more (botanically) uncharted territory in Ha Giang province, as well as various day trips here and there. The food is great and the people are friendly. Dog tastes like lamb. Our guide was a friendly and helpful dude. Fan Si Pan looms large over his right shoulder. Aralia were fairly common at the roadside. This one is A. chapaense. Edgeworthia gardneri in bud. It made shrubs to at least 2m high. Dendropanax trifidus. An araliad shrub/small tree. Tetradium austrosinense. The undersides of the pinnate leaves of this fast growing handsome tree are pink on the newer foliage. Not known in UK cultivation…. until now. Schefflera macrophylla was found at mid elevations in full sun as here, where it has a compact crown, or in shade, where it doesn’t. One of the amazing ferns from the family Gleicheniaceae, Dicranopteris linearis. These can be weedy monsters, climbing over other juicy delights, but I will forgive them. From our hotel balcony in SaPa we could see what lay ahead after breakfast; a wee hike up Fan Si Pan. Note to self: Must do some training beforehand next time. Curculigo crassifolia was a trackside weed at mid elevations. Pleasant enough. Dichroa aff. hirsuta. A Hydrangea relative. Talking of Hydrangeas; this one is H. indochinensis. Not likely very hardy, but what foliage. Some forms however don’t have the purple undersides. An all too familiar site once you get into the forest. Cardamom growers are destroying the understory, across vast areas, for an easy cash crop. Everywhere we went (up to a certain altitude) this was happening, even in nature reserves. Polyspora species, a Camellia relative making a small tree, was shedding flowers all over the place. Vast swathes of mega rich virgin forest on the slopes of Fan Si Pan were destroyed by fire from Chinese shelling in the mid 1970’s, apparently. Looking north from the path on Fan Si Pan in late afternoon. With all our planty faffing we were behind schedule and had quite some altitude to gain to get to camp before dark. Swivelling round to the east you can see that at this altitude we are amongst a thicket of relatively small bamboo with occasional shrubs. Next morning we surveyed the scene around our campsite. A sea of Borinda to a height of about 4 or 5m. Schefflera alpina are cute and always a pleasure to greet at the edge of the path. Camp 2 was spent under Lithocarpus etc, beside a rather pleasant, boulder strewn river. This is the top of a Schefflera macrophylla that has been felled by cardamom planters. SHOCK HORROR! Note the undersides of the leaves are very pale, almost white. This is one of the largest S. macrophylla we found. Note how open the crown is when growing as an understory plant. An iridescent blue Begonia in deep shade. Probably undescribed. I just loved this fabulous fern. Dipteris conjugata. Some members of the crew enjoyed toasty tadpoles for lunch. These surprisingly large babies (about 10cm) were hooked out of the river by our porters. Yum. Our Black Hmong ethnic minority porters posing in front of a Huodendron. A tree that often made quite magnificent specimens at mid elevation. The bark is very thin, with a satin finish and exfoliates every year in patches. The French half of the expedition, Charles, poses with what we believe to be Blechnum orientale. My literature has this as growing fronds to nowhere near this big. These were about 2.5m! Dawn in a stilt house village in the middle of nowhere. We had to fill rivers with rocks 4 or 5 times, in the dark, just to get our 4WD vehicle up to this place, where we were expected for a home-stay with the locals. The WC, which projected out over this pond, had a palm leaf for a door and last night’s supper made good eating for the carp directly below. Our new porters head off toward the giant Fishtail palm Caryota maxima (not that they had any interest in it), flanked by Livistona jenkinsiana. Our day was to be spent climbing hard from 500m asl to c.2000m asl. Caryota maxima towering above a river. Livistona jenkinsiana were common in the landscape. The underside of the fronds was pale and stood out quite strikingly from a certain angle. Our task was to reach the right hand peak on the skyline by dusk. Mission accomplished. I just love that rice-paddy amphitheatre in the middle. Our porters were gathering bamboo shoot tips as they went, which made a delicious lunch, spent in a cardamom growers hut. This is perhaps Gamblea pseudoevodiifolia. As we gained height we reached further into the ancient, almost untouched forest, which of course is now being planted up with cardamom. A probably undescribed Begonia sp. Who needs a tent when you have a rock? Our climb from 500m to over 2000m was a sweaty one. The ancient forest canopy above was a site for sore eyes. This is probably Acer campbellii, in autumn garb, making a tree hugely bigger than it gets to in the UK and smothered in epiphytes. This Ophiopogon grew an upright stem to about 30cm. Anyone recognise it? I’m thinking probably not. On our return back to SaPa we stopped to stroke another member of the Gleicheniaceae; Gleichenia truncata. Back up in the temperate zone we had the pleasure of handling the giant conkers (Horse chestnuts/Buckeyes) of Aesculus wangii. The biggest one I found was a whopping 8.5cm diameter, which makes it 1.5 cm bigger than Flora of China has it. This taxon is considered synonymous with A. assamica, which has a huge range, though botanists don’t agree and further investigation would appear to be necessary. A. wangii looms large through the mist. The largest tree of the species we found. I couldn’t believe my eyes when I saw these young Emmenopterys. I wasn’t aware this was in Vietnam, and, so it seems, neither are some experts with a keen interest in Asian flora. Woodwardia unigemmata as it should be grown, and no doubt enjoying the fog. It was a pleasure to see Liriodendron chinense in habitat. Note the foliage of adult trees compared to…. …the stark difference of a young vigorous specimen. 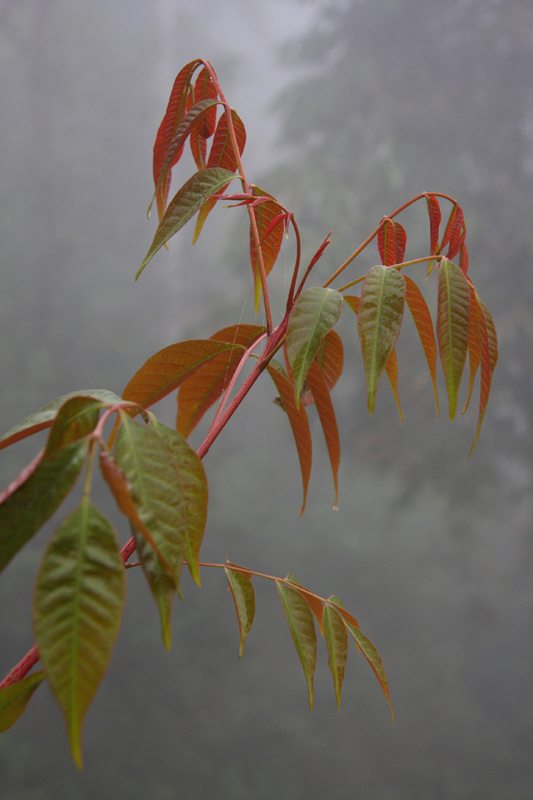 Rhus succedanea, a most elegant species with superb new leaf colour in this area. And to end, myself with the leaf of a close relative of Schefflera; Brassaiopsis bodinieri. Enjoyed your photos and comments very much. Pure plantsmanship. Curious if you saw Platanus kerrii in your travels? Thanks Dylan, glad you appreciate them. Didn’t see a Platanus anywhere I’m sorry to say.